History's lessons on the resurgence of a disease. A snapshot of tuberculosis’ turbulent history in New York City casts an ominous light on the low rate of infection here today. The mycobacterium that causes the disease is sweeping through lungs in the developing world and mutating resistance to the antibiotics that have treated it for the last 40 years, but in the States it is at record low levels. It has been overshadowed, rightfully so, by news of swine flu and the stories that do turn up are often reported from far away places like South Africa and Southeast Asia. Historically, though, the disease rate has surged when our attention drifts elsewhere. The recession’s grip on all levels of government around the country has squeezed the budgets of health departments. One of the latest reports is of an underfunded county health program in my home state, Colorado. Chrispin Kambili, a medical doctor and head of New York’s Bureau of Tuberculosis Control recently pointed out the trend. In 1910, New York City’s rate was 670 cases of active tuberculosis among every 100,000 people. 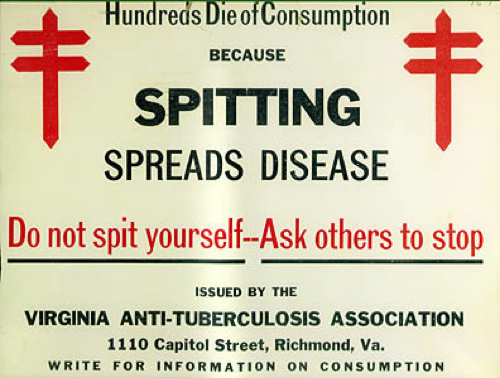 The rate dropped to a third of that by 1920, not because of medication – the first antibiotic treatment, streptomycin, was not used until the mid 1940s – but because of improved public hygiene. It continued to decline decade after decade until 1985 when it reached a low of 26 cases per 100,000 people. Then the cases nearly doubled in seven years. The reason, Kambili explained, was budget cuts. Those who study tuberculosis remind us that it is a social disease. It is an airborne bacteria that spreads through the coughs of the infected, so it would seem that it should be blind to social class. But it usually afflicts the poor. They are more often confined to smaller living quarters where it can spread among family members, and they tend to wait longer before seeking treatment. Hidden, as it is, among the poor, when infection rates drop, local governments scratch tuberculosis from their lists of priorities. Last year New York had just 11 cases per 100,000, the lowest the city has seen since it began keeping records. In this recession, I wonder if that good news should worry us. It is easy to ignore here, and health authorities like Kambili are working to keep it out of the headlines, but they know that tuberculosis has not gone away. “It remains with us, highly prevalent and transmissible,” said Lee Reichman, a medical doctor and head of the Global Tuberculosis Institute at the New Jersey Medical School. The institute is working with two dozen drug companies to create new tuberculosis medications, ones that may treat it more efficiently. Meanwhile, history has shown that tuberculosis can be subdued with good public health policies and health departments that are adequately funded. Studying the early stages of tuberculosis could help scientists figure out new ways to tackle the ancient killer. In Latin America, little-known infections wreak havoc, but their treatment is cheap. Great item–that poster is amazing. Last week, Dr. Robin Wood, a top physician-scientist from South Africa, was in Washington and he highlighted the need to return to just that sort of public health campaign against TB. Dr. Wood has found shockingly high rates of TB among children in Cape Town and says our current strategies to defeat this deadly scourge are woefully insufficient. Click here, http://sciencespeaks.wordpress.com/2009/09/29/dots-not-enough-when-it-comes-to-tb-in-south-africa/, to read more on Dr. Wood’s message.